You’ve just been beat by the Curse of Knowledge. Coined by the Heath brothers in their book, Made to Stick, “Curse of Knowledge” is one of the major obstacles to effective communication. It refers to the difficulty we all encounter when we try to communicate an idea that we understand, to listeners who are not yet acquainted with the idea. Last week I gave a presentation in our Creative meeting where we discussed the Curse and other ideas from Made to Stick. Here’s a brief overview of what we talked about and how you can conquer the Curse in your communication. Having reverse engineered some of the world’s most memorable and shareable ideas, from urban legends to proverbs to presidents’ speeches, the brothers Heath describe the common characteristics that sticky messages share. You and I can also use these characteristics to make our communication more effective and memorable. Briefly, these characteristics are: Simple, Unexpected, Concrete, Credible, Emotional, Story. (Yes, this happens to make a sticky little acronym too!). Go here for a brief overview of these characteristics, or download the first chapter of the book here. Before we even see the need to re-work our messages to add the “stickiness” factor, we need to conquer the Curse of Knowledge. The Curse of Knowledge rears its ugly head whenever we’re explaining the benefits of our products to potential customers, developing advertising campaigns, building websites, teaching a class or sharing our vision to donors. Oh, and it also shows up whenever we email someone or talk to them face-to-face (does that pretty much cover it? ;)). We need to consider what our message will sound like to someone who has never heard the idea before and has none of the background info that we do. 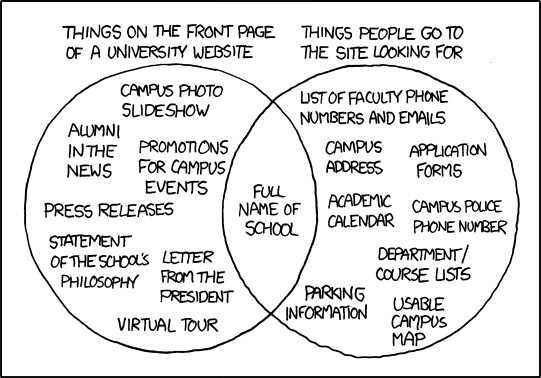 Dave shared the graphic below that portrays the disconnect between universities (and most other organizations) and their audience when developing a website. This is the Curse of Knowledge at work. How do we reverse the curse? To conquer the villain, we can often simply take a minute to ask, “How would someone who’s never heard of this idea before understand what I’m saying?” Depending on your situation, it can be helpful to keep a particular user or listener in mind. When developing web interfaces, we often ask the question, “Would your parents (or grandparents) be able to navigate this site?” This helps reveal the things that are “obvious” to the web-savvy user, but not so obvious to the majority of the public. When designing an online ad campaign, I often have the privilege of being on the “outside” when it comes to the business I’m designing for. I can ask, “Would this message have made sense before I researched the company?” “How many clarifying questions did I need to ask before the name of that big sale they’re having made sense? 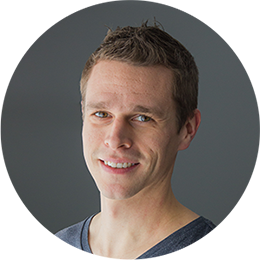 Given my perspective, I’m able to help steer the client to a message that will make sense to their potential customers. What curse-killing-question do you ask to help communicate effectively to your listeners?